On March 25th of 2003, Hollywood Records released Seven, The Best Of Stryper that included 2 new songs (Something and For You). That fall, they embarked on a 35 city tour that both fans and critics agreed was one of the hottest tours of 2003. In March of 2004, Stryper triumphantly returned to Puerto Rico to play a sold out show that was recorded for a DVD release scheduled to come out later in the year. The prayers of Stryper fan everywhere were answered in May of 2003 with the new live CD recording titled 7 Weeks: Live In America. The last scheduled concert at the time of this writing is at Walt Disney World in Florida on Sept 10th. 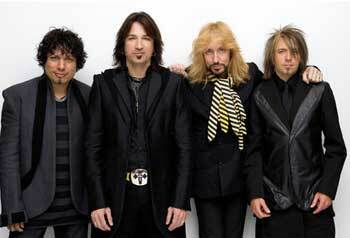 Stryper.com was officially launched in November of 1999 by Craig Erskine and Brett Christensen. After years of designing the site, Craig has moved on to other projects and has handed the baton over to Greg Hayes in 2003. Stryper is managed by Deep South Entertainment, and works with Stryper.com to help keep the fire burning!